A version of this article originally appeared on the Symphonic Distribution blog. Being a musician in today’s music industry not only requires musical talent, but it also requires you to become a quick-thinking, creative mastermind in order to generate the most revenue from your music. There are many ways that musicians can earn money from exploiting their compositions, sound recordings, live performances, and brand. 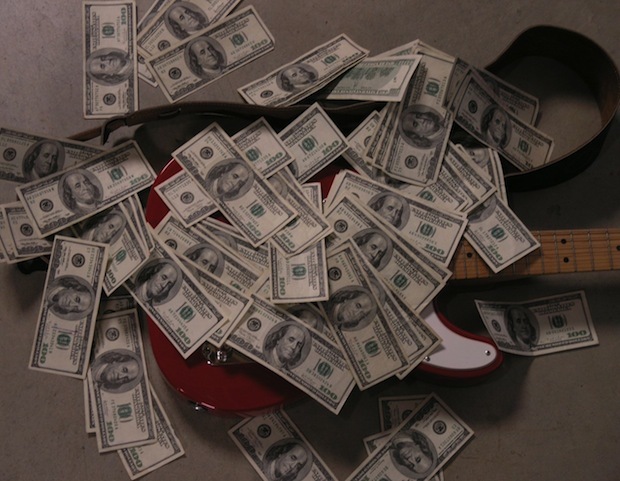 Here are six revenue streams you should be capitalizing on – other than just selling your music. Millions of subscriptions happen each day. The number of people subscribing daily is up more than 3x since last year, and the number of daily subscriptions is up more than 4x since last year. Not only do they have one of the largest user bases in the world, but they also get tons of exposure outside of the US, allowing you to expand your viewership and fan base. If you are ready to start monetizing your YouTube channel, Symphonic Distribution can help you. Publishing administration is an animal that has recently been tamed for the ease of the independent musician community. More musicians are now aware of this vital revenue stream, which in past years many had been missing out on. So what is publishing administration? In the music industry, publishing refers to the ownership, control, and commercial exploitation of musical compositions. It further involves the collection of all royalties ensuing from the usage of musical compositions. Music publishing is the business of songwriters, composers, and lyricists. So how does this help you make money? Guess what? Your songs have been generating publishing royalties (which include performance and mechanical royalties). If your songs aren’t registered with performing rights organizations or mechanical royalty collection agencies, you are not collecting all your mechanical or performance royalties from your music. Unless you register yourself and your compositions, you will never see these royalties. So it’s really important that you get yourself a publishing administrator that can do this on your behalf at an affordable cost. Most will charge you anywhere from $75 to $100 to register your works in collection societies around the world, and will keep 10 to 20 percent of the royalties they collect. (Be weary, though, of how much control they will have over your music!) Some companies bundle several services into one and will not only collect your publishing royalties, but will sometimes handle your sync licensing exclusively as well. Find out more about how publishing administration works here. Stores, hotels, restaurants, and more all need background music for their establishments. The largest companies that used to focus on this type of service were DMX and Muzak. Today these two companies have merged and formed Mood. They house the industry’s biggest and best rights-included music collection for background music. Mood prides itself as a censorial media specialist, using music and video linked to brand personality. Symphonic Distribution's licensing department works with Mood designers to handpick each track for submission to its channels, which you can apply for here. If you’re a record label/master rights owner, and your master recordings are being publicly performed and broadcasted, you’re earning neighboring rights royalties. This is completely separate from the field of music publishing, in which songwriters and composers earn performance royalties from public broadcasts of their musical compositions. Contact Symphonic Distribution to find out if you're eligible to collect neighboring rights royalties. Selling merchandise is one of the best ways to generate income for your band, record label, or artist brand. As a matter of fact, it may be the only source of income that you as an artist can easily control. If you are a record label or musician, the most important thing you have (besides your talent, of course) is your fans. Take care of them and come up with some cool options for branding your music, and have your merchandise available at all your shows and on your site. Not only will it be a nice treat for your fans, but you’ll also have free walking advertisements. Janette Berrios is the Marketing Manager at Symphonic Distribution, US based digital music distributor. Symphonic Distribution strives to provide record labels and artists affordable delivery solutions and tools to spread their music worldwide to their 300 + partners, with a personalized approach and unparallel customer support. Symphonic’s team of passionate individuals pride themselves on offering quick responses and direct one-on-one conversations and the advising of clients, from the basics of managing a social network and mastering to brand development and fine-tuning a marketing plan.